Everyone wants their home to be comfortable and attractive. And window treatments play a big part of that. 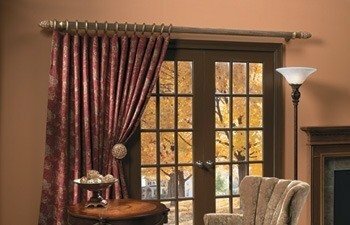 Window treatments not only enhance the look of your home, they help protect your home from the damaging rays of the sun, from heat, and provide much needed privacy. 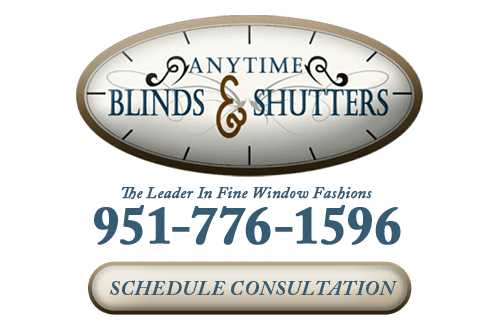 At Anytime Blinds & Shutters, the goal of our professional Consultants is to show you the best window treatment options for your home. We have a wide variety of styles and colors, to suit any taste, design, and budget! We work with some of the top brands in the window covering industry, such as Norman, Century, and more. Every order is custom made by our manufacturers to your window specifications. Once complete, our skilled installers will return to install your beautiful new blinds, shades or shutters in your windows. Call us today to schedule your free in-home consultation, and our professional team will come to you and help you select the perfect window treatments in the comfort of your home. Wood blinds are one of the most timeless window treatments. Their natural beauty makes them a great enhancement for any kind of interior design, or for any homeowner looking for a classic style. Available in a wide variety of colors and styles, wood blinds create an elegant look for your home. Wood blinds can be ordered with “routeless” option, which provides even greater privacy and light blocking, and are available in cords free lift, which is safer for children and pets. For the homeowner looking for a simple, affordable window treatment that still has that classic style, Fauxwood blinds are the perfect option. Made of durable composite materials that mimic the look of real wood, Fauxwoods are easy to clean and care for and are more resistant to fading. Many manufacturers now make their Fauxwoods in cord free lift as well, in compliance with the Window Covering Safety Council recommendations for Child Safety. 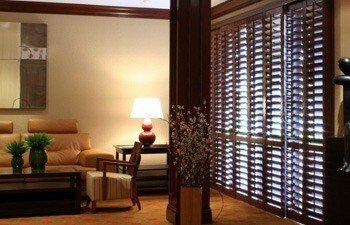 Shutters are one of the oldest window treatments used in homes. For more than 500 years, people have been using shutters to cover their windows and provide maximum privacy. Their classic style and appearance can make even the simplest home look grand and elegant. Easy to clean and care for, shutters can also provide insulation, which helps your home’s heating and cooling efficiency. All of our shutters are custom made, to your home’s exact window sizes, then professionally mounted and sealed by our expert installers. 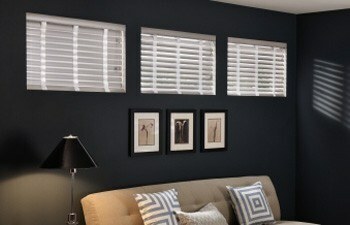 These shutters come with an extended warranty against fading and broken parts. Roller shades are the hottest window coverings in the industry right now. Roller shades can provide privacy, control heat and light with greater efficiency than any other window treatment. They are easy to clean and care for. Our roller shades are locally made from top quality fabrics like Phifer, Mermet and come in a wide array of styles and colors. We offer a variety of versatile control options as well, including motorization. Here at Anytime Blinds, we are experts in shade motorization! Roller shades not your thing? Not a problem! We also offer honeycomb shades, which provide excellent light control, heat insulation, and can even provide some acoustic insulation. Ideal for bedrooms (Especially the baby’s! 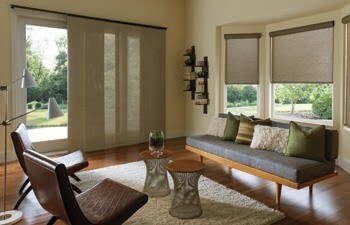 ), honeycomb shades come in amazing colors and textures to fit any design. Looking for a more rustic, natural look? Consider Woven Shades. These simple, roman-style window treatments are made from natural bamboo, reeds, and grasses, to bring a rural look to any room. 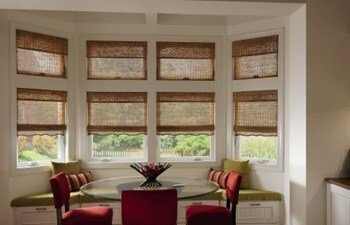 Available in a large variety of styles, Woven Shades can be made unlined, to allow soft natural sunlight to trickle through, or lined, for maximum privacy and light control. 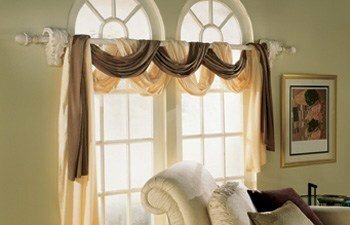 Or for a more classic, elegant look, consider Roman Shades. These timeless fabric window coverings can be made in almost any fabric you desire, giving you endless options for matching your décor. Whatever your shading preference, our expert consultants can help you select the perfect shades for your home. Shopping for new window blinds, shades or shutters can feel overwhelming. With so many different types of window treatments to choose from, it can be tough to decide which option is the best for your home. That’s why our expert consultants work to help make the selection process as frustration-free as possible. We will work with you through the selection process to get you the coverings you want and the style you crave. 100% customer satisfaction is our #1 goal! 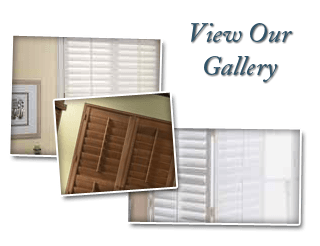 If you are looking for an expert in shutters, shades, and blinds in the Riverside area, please call us at 951-776-1596, or complete our online request form.